﻿ san diego wine – Vinmetrica – Sulfite (SO2), Malic, Alcohol & pH/TA tests for Wine, Beer & Kombucha. By now you know that Vinmetrica has the reputation for providing simple, low cost, fast and accurate tests for winemakers…tools that let you make the best wine you can. In this installment of the winemaker’s blog, we’d like to give a brief account of our origins. I founded Vinmetrica in early 2010 to put together products that would help winemakers like me. This belief crystallized over several years and several events. In 1993 I moved to Palo Alto with my family after living in Indianapolis for 8 years working as a research scientist at Eli Lilly. We bought a house whose back yard harbored a venerable apricot tree, a remnant of the fruit orchards that used to occupy most of the Santa Clara Valley (aka Silicon Valley) in the early part of the 20th century. It was a very productive tree, and after making several cases of apricot jam one summer, I still had several pounds of apricots left. It occurred to me to try to make wine out of them. It wasn’t long before I was fussing over 5 gallon batches of apricot wine, and gradually I found myself learning the ropes of fermentation chemistry. Over the succeeding years I graduated from fermenting fruit to condensed juices, then to wine kits and finally grapes (though I still like the dry apricot wine one can make from sugar, water and halved apricots). Inevitably I was confronted with the task of measuring my sulfite levels. Now, as an analytical chemist by training, I understood the basics of measuring sulfite by iodometric (or “Ripper”) titration. You take a measured quantity of wine, add acid and starch solution, and titrate with an iodine solution of known strength until the color turns blue. My local winemaking supply guy recommended the Chemetrics Titrets® which essentially minimize this procedure into handy measuring ampoules. Despite the manufacturer’s admonition that these are not suitable for red wines, I kept trying to use the Titrets for a whole winemaking season before finally giving up. You just can’t see the blue endpoint reproducibly. Next I went on to doing the full Ripper method with starch. But again the red wines defeated me. I would be fooling myself in claiming that I could see that blue endpoint in any kind of reproducible way. So I cobbled together one of these electrodes as best as I could remember. Two platinum wires from ah, disused equipment at work, a few components from Fry’s Electronics, and an output that I read with my voltmeter. Wasn’t much to look at, but I found I could get reproducible results in minutes. This was about 1995. I used this setup for years in my garage. In July of 2008, a year after my former company was acquired, my position as Vice President of R&D was phased out. Soon after that I left Palo Alto and joined my wife in Encinitas near San Diego, where we had conducted a commuting marriage for the last 6 years. Jobs were not plentiful at that time, especially in my field. I started Sportsman Consulting and had a few clients, but it wasn’t much. I had talked with my wife about the sulfite meter – would other winemakers want a tool like this? She encouraged me to pursue it. About this time I had opened a lab in some warehouse space that I rented from a friend in Carlsbad. Sportsman Consulting had just enough income to pay the rent. I built a simple prototype sulfite meter and sent it to Dave, a former colleague of mine who had been a marketing director at Molecular Devices, and who is a serious winemaker in the Santa Cruz mountain area. Dave had just purchased a Hanna 84100 SO2 autotitrator himself, after struggling for years to keep his sulfites under control by other methods. Dave endorsed my idea of a simple and accurate sulfite test and agreed readily to be the first guinea pig. Dave did some comparisons and reported that the prototype gave results that were quite close to the Hanna. So far, so good. I retained a local electrical engineer and we put together the SC-100 prototype in about 4 months. In the meantime I worked out the details of the chemistry to make it a stable product, and found a manufacturer that could make the electrodes to my specification. More comparative data was forthcoming. Dave really liked the new prototype and showed it to some colleagues in the winemaking business, and I began to get some feedback from other winemakers. 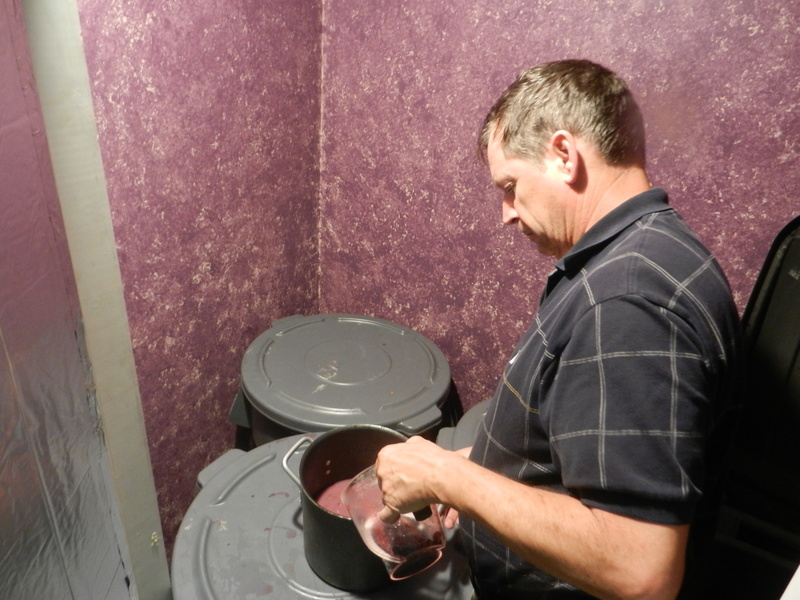 One of my first early demos was with three Ramona Valley winemakers who were getting ready to bottle their Merlot. We did a side by side comparison between the SC-100 and their manual Ripper method. They way they did their assay was illuminating: take a 10 mL wine sample. Dilute it with about 100 mL of water. (Gasp! You’re going to make the endpoint very fuzzy!) They explained that by so diluting it, they could reduce the opacity of the red color to see the blue endpoint better. They added starch and acid in the usual way. Then they took a 10 ml graduated pipette and filled it to the zero mark with 0.02N iodine. (Gasp! This is your burette?!). They then titrated from this pipette. It took 0.3 mL to reach an endpoint that they all agreed to after some squinting. This calculated out to about 20 ppm of free SO2. At the same time, I did an assay on a 25 mL sample in the usual way using the SC-100. I determined 6 ppm. We talked about this, and they agreed to repeat their method, this time using a 25 mL sample. They titrated to the endpoint that they felt was correct: also 0.3 mL (mind you, reading 0.3 mL off a 10 mL pipette isn’t exactly giving yourself much resolution!) Hmmm. But of course now the calculation gave 8 ppm, since they had taken 25 mL instead of 10 ml wine. Then I suggested we check the strength of their iodine solution. I produced a vial with pre-weighed amounts of ascorbic acid – I use these as a quick check of my SO2 Titrant and they are accurate to 5%. Turned out that their 0.02N iodine solution, which was near its expiry, was actually 0.015N. So their 8 ppm was actually 6 ppm, and in fact we had numbers that agreed exactly! With several examples like this under my belt, I knew we were ready to release the SC-100 in late 2010. Our assessment of the competition showed that inexpensive sulfite tests available for winemakers were not practical. Titrets don’t work in red wines. People report struggling to use the Accuvin indicator tests. Aeration Oxidation (AO) is time consuming and somewhat complicated. Other options were: sending out samples for analysis (~$20 a pop), or buying an autotitrator of some kind ($900 or more and significant yearly maintenance.) And even the autotitrators require calibration each time you use them, adding significant time to get the job done. In the two years following the release of the original SC-100, we sold over 600 of them. In 2012 we released its successor the SC-100A, as well as the SC-200 pH/TA analyzer. Our flagship analyzer is the SC-300, great for those who want to get reliable testing for pH, TA and SO2 without spending a fortune and sacrificing large amounts of bench space. We also offer analysis services through our website at www.vinmetrica.com so you can submit samples for testing if you want. All the tests above are available, as well as many more. Most importantly, what we hear from our customers is satisfaction. “Great product! “I love my Vinmetrica” “My Hanna is now a door stop!” Our commitment to our customers is to make reasonably priced, easy tools for winemaking, and then provide rapid, quality technical support so that you can take control of your winemaking.